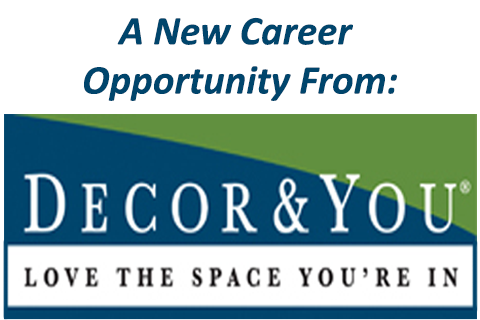 Jumpstart a new career in interior design and start making $$$$ in 12 weeks! Decor&You can give you the training, tools and skills you need to go from newbie to expert in 12 weeks as one of our franchise owners. Even if you have never started a business before, and even if you don’t have an artistic bone in your body. You get all the perks of OWNING a business… without having to put up all the sweat and blood to START a business. You'll be taught A+ design skills, and get our huge bank of worksheets, idea planners and scripts needed to guide your clients through the décor process. You'll become a high-demand consultant without needing an inventory, an office, or a brick-and-mortar store. You'll join our D&Y support network full of designers of all levels who help each other grow. You'll learn exactly how to launch a grand opening and land your first clients, and piggy-back those into more clients. You'll know how to market yourself life a pro. Use our proven client-attracting methods, if you can follow directions you can land clients the easy way. You'll fast-track yourself to become the authority designer in your area, beating out other more established designers in the process (it's easier than you think). You'll instantly get our rock-bottom wholesale discounts on all the décor merchandise you'll offer to clients, like furniture, rugs, lighting, everything. Founded in 1994, Decor&You has withstood the test of time. And with the entire décor industry on a steady year-over-year incline ($700 BILLION globally last year), there’s never been a better time to join. We’ve won awards across the country for our business model, including being featured in Entrepreneur Magazine 4 separate times. We’ve helped people from all walks of life start successful businesses: stay-at-home moms, teachers, and people burned out on corporate America all have lucrative new careers thanks to Decor&You. What makes this system so easy, while also being profitable for newcomers? In our industry, Decor&You is the “un-designer.” While other big-name studios have a distinctive “look” to their room designs, we do things differently. Baked into our system is the idea that we listen to what our clients REALLY want instead of trying to fit a brand’s mold. That means more custom-fit service, happier clients, and more referrals. This isn’t just some online class. After all, you’ll be representing the Decor&You name, so we’re invested in your success. Along with the coursework, you’ll be trained 1-on-1 with a mentor who’s succeeding in the industry right now, and you’re invited to our On-Site Education program to learn in person from the best. Even though you’ll acquire every skill necessary for a successful design career in 12 weeks, the training doesn’t stop there. Want to grow from a solo consultant to a team leader? We have the stepping stones in place so you can grow your business exponentially beyond 1-on-1 client work. That’s the difference between owning a business and having a job: you don’t want to work for a company, you want your company to work for you! This opportunity is built with freedom and flexibility in mind. Already have other obligations? Or maybe you just want to work part-time. When you own your own business, you work as much as you want, whenever you want. All while following a PROVEN roadmap to start, grow and master your own highly profitable business? If this sounds like an opportunity for you, we’re currently accepting applications for new designers. Come see if you’re a good fit!